First, open the bottle of water and dip your toothbrush into the bottle to wet it (don't crash, keep control of the vehicle). 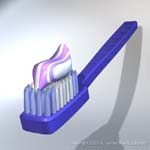 Then, put some toothpaste onto the brush(don't crash). Proceed to brush your teeth(don't crash). After you are done brushing, put some water in your mouth to rinse(don't crash). While the you are in the process of rinsing, dip your toothbrush into the bottle to rinse it off(don't crash). Once the brush is clean, spit what's in your mouth into the bottle(don't crash). Return the cap to the bottle and discard. If you have gotten to this step, you probably still have control of the vehicle....good job. Now you have nice breath and clean teeth. Feel free to proceed with your trip. If you are wondering why I posted this, I will surely tell you. I went to the Bay Area yesterday for the majority of the day. On the way home I needed to brush my teeth....I don't like yucky teeth, especially on a 3 hour drive. So, I brushed my teeth on Highway 5 through Stockton. :) Mmmmm, I love clean teeth while driving. (I know I'm quirky, you don't have to tell me that). Have a good day!! !